I'd like to tell you the truth: I suspect that I receive more pictures of desserts that people have eaten than the average bear. People are sending me dessert pictures all the time. Usually, though, they don't do things that would satisfy my spy curiosity, such as include what the dessert is or where they ate it. They just send a picture. 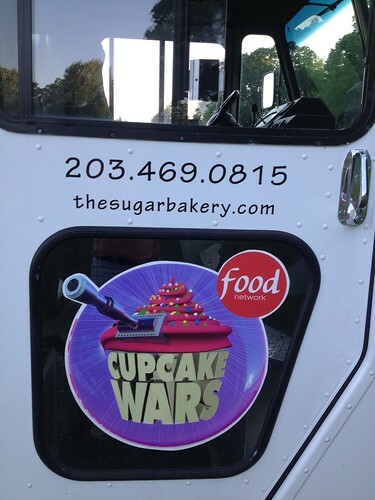 But a few days ago, when a few of my friends were at a Zombies concert in Connecticut and saw a cupcake truck, not only did they send me a photo of the partially eaten cupcake...but they included tasting notes and more information about the truck, too. It has a cute story, so I thought I would share it with you, dear readers. 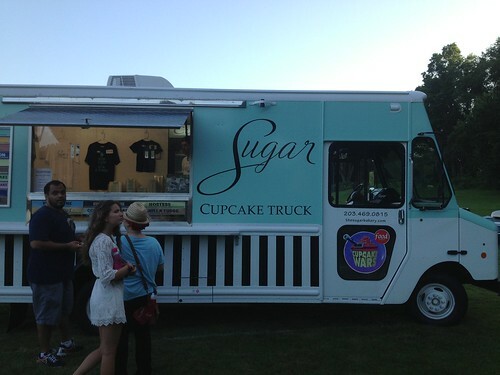 The truck is the mobile outpost of East Haven's Sugar Bakery & Sweet Shop, a bakery which has been around since 2004. It's run by a mother-daughter team, Carol Vollono and Brenda DePonte. According to their website, Brenda had been living in New York City studying fashion merchandising and marketing, and missed her family, but even more importantly, she missed how they connected over dessert. While visiting home, mom and daughter were having a sesh discussing their dreams and future plans, and somehow dessert came up. Inspired by the dessert boom in the city and wanting to take advantage of mom's baking skills, they decided to give commercial baking a go, putting a new twist on classic recipes. Apparently, "The collaboration of the two minds was epic. Sugar Bakery was born!" I think that's cute. But cuter still? The goods. They're delivered in this adorable truck. Wouldn't you be happy to see this at a concert? 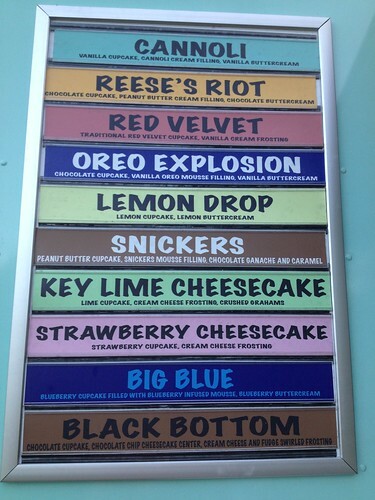 And wouldn't you be even happier, when you approached, to see this menu? Well, they must be good if they've been on TV, right? Definitely time to give it a try. 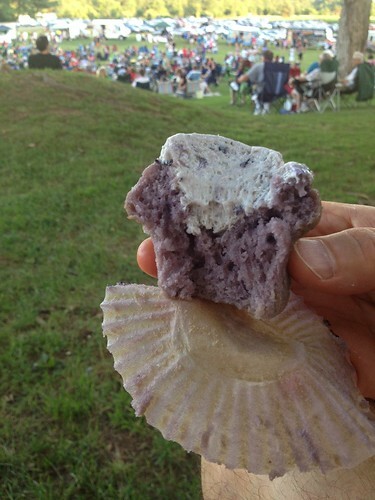 My buddies chose the "Big Blue", a blueberry cupcake with blueberry mousse filling and...you guessed it, blueberry buttercream. Here's a before shot. 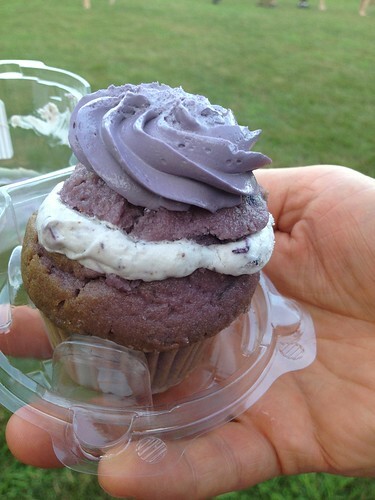 As reported, this was a very good cupcake, not to mention healthy "account of the blueberries". That definitely fits into my world view of sweets! Sugar Bakery and Sweet Shop, 422-424 Main Street, East Haven, CT, with a roving truck, too. Find them online here.